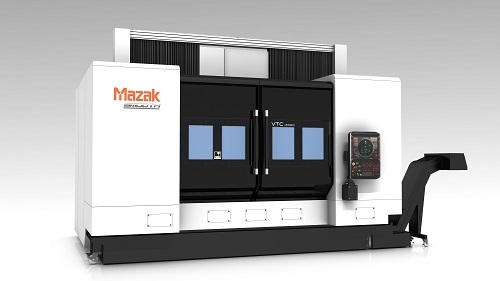 Mazak Corporation has improved its VTC-300C Vertical Machining Center with the addition of the MAZATROL SmoothG CNC and its suite of SMOOTH TECHNOLOGY software solutions. The new control complements the VTC-300C’s full traveling-column design, automatic tool changer and powerful 40-taper spindle, all of which combine to enable fast cycle times and accurate machining for extremely long and heavy workpieces in industries such as construction, agriculture and energy production. Job shops and major manufacturers alike should benefit from the VTC-300C’s new MAZATROL SmoothG CNC and its innovative programming, performance and monitoring functions, as well as the ability to use both EIA/ISO and conversational programming to bring optimum speed and accuracy to complex part production. Advanced hardware – including a pivoting CNC panel and intuitive, 19" multi-touch LCD control screen – allows for complete ease of use, while a CFast memory card stores up to 32GB of program data. The new control complements the existing VTC-300C machine platform, which delivers a standard 15,000-rpm, 30-hp (10% ED, 110 nM) 40-taper spindle capable of handling a wide variety of metalcutting applications. Additionally, the machine and waycover design has been enhanced to provide 1,582 ipm rapid feedrates on all axes. Its fixed 78.74" by 30" table provides process flexibility for a wide range of applications, while an optional center partition can divide the work envelope into two separate work areas to allow the machine to be in cycle in one area while loading, unloading or setting up a part in the other. The machine’s axis travels are 65.35" in X, 30" in Y and 25.6" in Z.